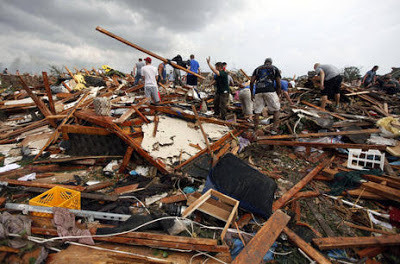 Today our sincere thoughts and prayers are for those affected by the recent tornadoes in Oklahoma and surrounding areas. Many have lost precious loved ones, homes, places of worship, schools, livelihoods etc. Most of us are far from those areas and unable to do much physically, but we pray for and want them to know that we care very much and will do what we can to help. We encourage all to do as they are able. Humanitarian Aid is within the grasp of most of us. Mormon Helping-Hands will most-assuredly be out there soon (if they aren't already) to assist! Thank you for all the good that you all do! We're in this together. We have a commission from the Savior to bless and help and lift and serve our fellowman.